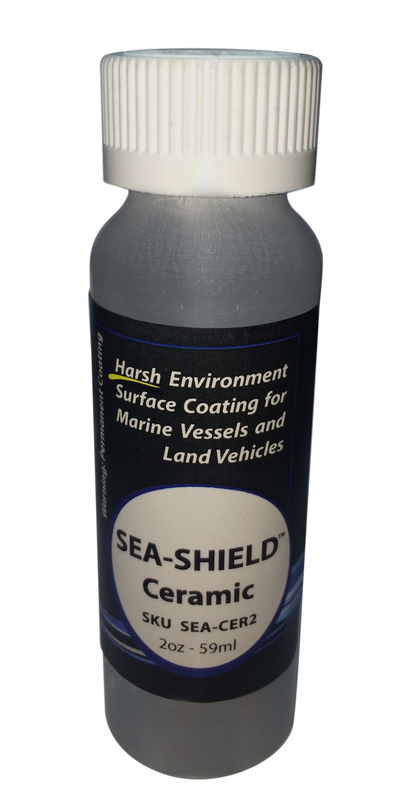 Sea-Shield, a world-wide leading provider of surface coating for yachts and watercraft, is proud to announce it is expanding its product offerings with Sea-Shield Ceramic, a non-toxic surface coating designed for marine vessels and land vehicles in very harsh environments. Sea-Shield Ceramic is designed to handle temperatures up to 1000 degrees Fahrenheit, and permanently bonds to most surfaces. It protects from UV rays, corrosion, hard water, salt and exhaust build up while providing a super gloss and mirror-like shine. The product also utilizes the Sea-Shield trademarked Exhaust Guard® Technology, a resin-based surface sealant designed to seal and protect finishes from black streaks, engine exhaust, industrial fallout, salt air, acid rain, and ultraviolet rays. It also seals and protects paint, gel coat and hypalon, as well as provides an amazing wet look shine. In addition to being used on yachts, Sea-Shield® Ceramic is currently being used on land vehicles, including off-roading racing trucks in some of the world’s most extreme terrain races in the Baja California dessert. Sea-Shield provides a series of products as well as the training for how to apply the products to the appropriate surfaces to ensure the best results. For more information, please visit www.seashieldsystem.com. The Sea-Shield System is a series of products designed to clean, polish and protect yachts and watercraft surfaces from the harsh conditions caused by constant exposure to salt water and damaging ultraviolet rays. The Sea-Shield method has the potential to produce a like-new finish for surfaces when used appropriately and with appropriate application method.